Anyone who has ever lived or worked on a farm knows the difference between "good" jeans and "work" jeans. Your good jeans are for wearing when you go to town. Your work jeans are for wearing when you do anything besides go to town. If you've never had the dilemma of retiring good jeans to the work jeans category due to a barbwire hole or a stain of unknown origin, you are obviously much better at keeping your jeans just for town than I am. It never fails. Just as I've put on good jeans, I get the call to help with [insert some kind of farm emergency here (ex: cows are out, pivot is stuck, husband is stuck)]. "And no! There isn't time for you to change your jeans! I need you here now!" It is reasons like this why my stack of work jeans is always towering over my good jeans pile. Speaking of stacks, living on a farm generally corresponds to living in blue jeans. Therefore, the stacks of blue jeans are quite large, and when laundry day comes around, the jeans are split into two loads of jeans: one load for good jeans and one load for work jeans. We cannot have them mingling! Who knows what the good jeans will be exposed to by those filthy, dirty work jeans! But seriously... no mingling between the jeans. 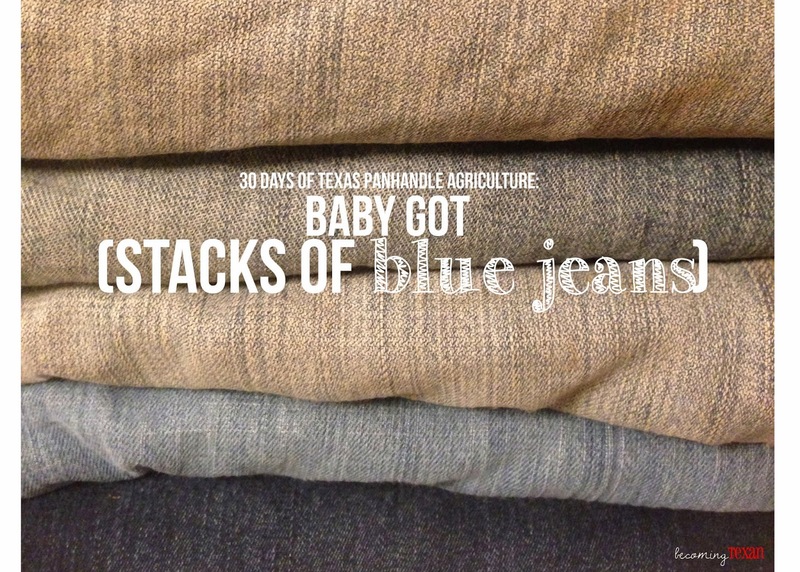 Prior to living in the Texas Panhandle, I took my stacks of blue jeans for granted. I mean, Levi Strauss is always going to make jeans from thin air, right? Seeing as how I grew up in South Dakota, I didn't really know what cotton was, where it came from, or why certain cotton is used for blue jeans versus t-shirts. You could say I was a bit disconnected from the cotton-picking (or -stripping) reality. Then I moved to the middle-of-nowhere Texas Panhandle. Now I'm a bit more familiar with cotton, like I can see quite a bit of cotton from my front porch. Also, part of my income directly relies on cotton to do its thing and make cotton. Funny how things change, isn't it? I've also learned to not take my blue jeans for granted because just like every ag commodity, there are a bunch of hard-working farmers doing their best to raise upland cotton for my jeans. Before I lived in Texas, I thought cotton was cotton. Then I moved here and learned about the difference between Pima and Upland cotton. Apparently, Pima cotton is what farmers grow in the Deep South and Southwest (Arizona, California). Pima cotton, or Extra Long Staple (ELS) cotton, is generally used for softer and more luxurious fabrics (think soft t-shirts). Pima cotton isn't really suited to growing on the High Plains though. We have this thing here called "wind," and Pima cotton really doesn't like it. With our wind here, a field of Pima cotton would resemble a toilet-papered yard, and nobody likes TPed yards or fields. Instead of growing Pima cotton, we grow Upland cotton, which is much more resistant to wind. Compared to Pima cotton, Upland cotton has a shorter staple length, is thicker, and isn't quite as strong when weaved as its counterpart. That isn't all bad though because Upland cotton happens to be really good for making blue jeans. Which I like. A. Lot. By the way, Texas is the number one producer of Upland cotton, in case you were wondering. Texas is also second in the production of American Pima cotton. Upland cotton and Pima cotton are harvested differently due to their certain strengths. Pima is "picked," while Upland is "stripped." Picking just takes the lint (the actual cotton fiber) right off the plant, while stripping actually strips all of the leaves, bolls, burs and everything off the plant. Therefore, since stripping leaves more trash in the lint, it isn't quite as premium of a cotton once ginned as Pima. Once we start stripping cotton, I'll get some photos for illustration purposes. This will be my first cotton harvest so I'm pretty excited about it. This is the third day of my 30 Days of Texas Panhandle Agriculture Series. To read more, please visit this introduction post. If you have questions or ideas about Texas Panhandle agriculture, I'd love to hear them! I can't wait to see your pictures of stripping cotton!! I love my jeans, so thank you so much for growing the cotton that makes them. Thank you, Laurie, for rocking those jeans! Without people like you, we wouldn't be doing much cotton growing! I'm super excited about cotton harvest since it'll be my first time actually experiencing it! Hopefully I can get some good photos! When I taught math, we did a story problem about how many jeans, shirts, sheets, etc each field would produce based on modules, bales. We also talked about cost input, profit (or lack of) of each field. Fun lesson! That's a great idea, Scott! What a perfect way to teach about agriculture while teaching core requirements! Is Everything Really Bigger in Texas?